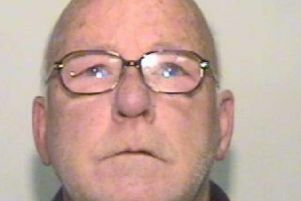 Police are appealing for the public’s help to trace a dangerous man after a couple in their late seventies were subjected to a horrifying kidnap ordeal. Between 3am and 4am on Thursday, March 16, Andrew Evans, 26, of Heath Street, Golborne, near Wigan, forced himself through the front door of a couple’s house in Lowton armed with a gun in one hand and a knife in the other. He demanded money from the man and his wife and then bundled them into their own black Landrover Freelander before driving them to a cash machine on High Street in Golborne Town Centre. He forced them to withdraw hundreds of pounds, telling them he needed the money for his dying daughter so he could buy her a present. He then took them back home, kissed the man’s wife on the hand and fled in the Landrover towards the East Lancashire Road after telling them he would leave the car in a supermarket car park for the couple to collect later. Minutes later, the car was seen travelling at around 70mph before it collided with a roundabout and flipped over. Evans is now wanted in connection with the incident and officers are appealing for the public’s help to trace him. Detective Inspector Paul Rollinson of GMP’s Wigan Borough, said: “This prolonged and harrowing ordeal has left this innocent couple shaken and petrified after being violently confronted in their own home. “It is extremely important that anyone who knows where Evans tells us at the earliest opportunity. Anyone with information about Evans’ whereabouts should contact police on 0161 856 7225 or the independent charity Crimestoppers, anonymously, on 0800 555 111.